Material: Outer fabric: 100% Cotton. Lining: 100% Polyester. Faux fur: 90% Acrylic, 10% Modacrylic. Gorgeous jacket with pretty, golden details from NEW LOOK. The jacket is lined, and has pretty, removable faux fur. 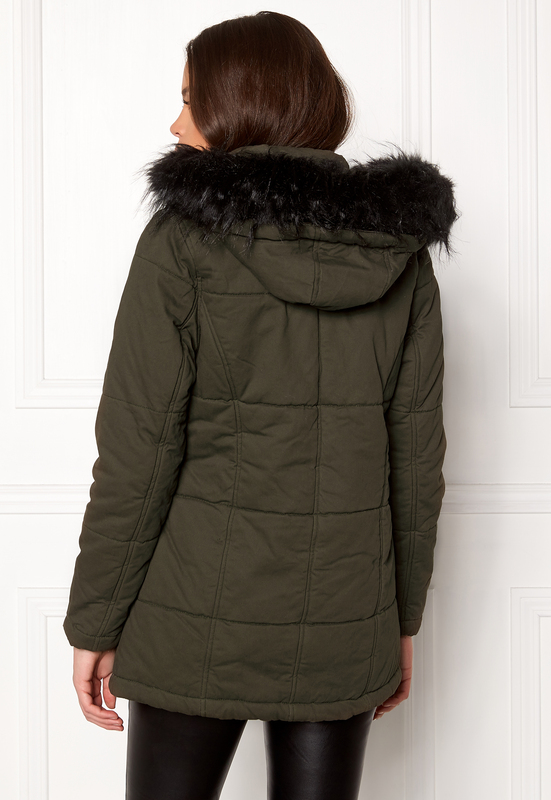 - Double closure with a zip and press studs at the front - Four front pockets with zips - Imitation leather around the front pockets - Removable faux fur on the hood Back length from shoulder 72 cm, bust 96 cm, sleeve length from shoulder seam 61 cm, in size S(UK10). The model is 176 cm tall and wears a size S(UK10). Machine wash at 40 degrees (delicate wash).